Many content marketing writers (like me) don’t come from a marketing background. But when you’re part of a content marketing project, you’ll likely find yourself on calls and in email threads with experienced marketers. They speak a different language than you and me. Hubspot Academy’s excellent Inbound Certification helped me learn some of the lingo, but I still find myself stumped—and sometimes amused—by some of the lingo. CX? Isn’t that cyclocross bike racing? Isn’t a pain point what happens when I fall while running on the trail? Not in marketing world. To help you become more fluent in marketing speak, I put together a short list of terms, translated into plain English. Got any you’d like to add to the list? Comment below! ABM – Account-based marketing. A marketing strategy geared toward one or more key customers or potential customers. B2B – Business to business. Content produced by a business for businesses. Or, companies that sell to other businesses. B2C – Business to consumer. Content produced by a business for consumers, aka, regular people that buy stuff. Or, companies that sell directly to consumers. Brand – A company’s image. Brand encompasses a company’s name, logo, image and mission. A company’s content should align with its brand. BDR – Business development representatives. If you write emails on behalf of clients, you may have to compose “BDR” emails. C360 – Customer 360. A data marketing strategy that attempts to get a holistic customer view. They do this by gathering and analyzing all the data they can about the customer. CX – Customer experience (not cyclocross racing). The customer’s feelings and attitudes about working with and/or interacting with a company’s products or services. CX encompasses everything, from the website and mobile app to tech support on the phone or the sales clerk at a store. Discovery call – Introductory call companies, including marketing agencies, have with a prospective new client. If they land the client, a kickoff call often follows. Gamify – To make a game out of marketing. Examples include giveaways, games (duh), quizzes and prizes. High-touch – Very important. A potential customer or existing customer that needs a lot of attention. The company considers that potential client as a big win, so it’s willing to email, call and/or snail mail them periodically, systematically over a long period of time. Hop – Get. As in, “let’s hop on a call.” Do not use. It’s annoying. Lead gen – lead generation. The act of acquiring potential clients. Someone who visits a company’s website and downloads a white paper, might, whether they like it or not, get a “lead gen” email soon after. That starts the process of pursuing the white paper-downloader as a potential customer. LOB – Line of business. What a company offers. If a company sells widgets and oranges, they have two LOBs. Marketo – A popular type of marketing software. For a while I thought this was slang for marketing. Now we know! Metrics – Stuff you measure with data. Pain points – Stuff customers complain about. Personas – Fake people marketers create as model clients or customers. Thought leadership – Content where companies share their knowledge on a given subject, usually related to what they sell or serve. Touchpoints – Ways customers interact with businesses; e.g., a website, mobile app, social media, on the phone or face-to-face. Use case – A scenario that describes how a product, service or system will achieve a business goal for the customer. Used in product development. In the tech industry, it means something totally different. UX – User experience. The customer’s feelings about working with or interacting with a company based on his digital experience. For example, using a mobile app. Vertical – Market. One company might market to police officers, new moms, and professional athletes. That’s three verticals. 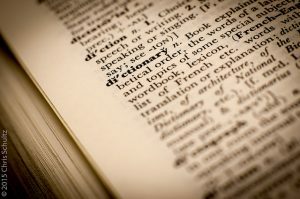 What marketing terms have gotten you stumped? Tell us in the comments below! ← 7 filler words that you just don’t need. Really.